Benefit Boyertown Area Fire & Rescue Each Time You Shop Amazon! You can support Boyertown Area Fire & Rescue every time you shop, at no cost to you – when you shop Amazon through AmazonSmiles. Choose us as your charity, and Amazon will donate 0.5% of your eligible purchases to us. Alternately, you can enter Amazon through http://smile.amazon.com and you will be prompted to choose your charity. 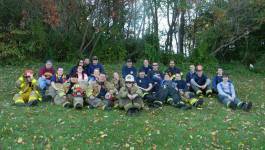 Type Boyertown Area Fire & Rescue and select us when the result returns.